I love artichokes. I used to like them canned and marinated (and I guess I still do), but I didn't know what I was missing until... the FRESH artichoke. I was afraid of the thing... it looked like a green armadillo. But, WOW! It's not hard at all. Now 3/4 of the fun of eating an artichoke (which canned purists are missing) is scraping the tender meaty flesh off the petals with your teeth! 1. 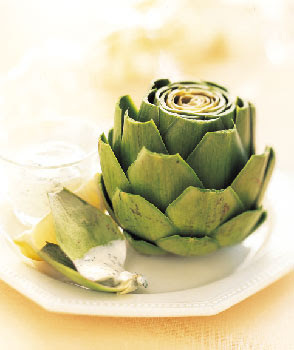 Prepare the artichoke by cutting the top off, removing some of the tough bottom leaves, snipping the leaves, and rubbing it all over with one of the lemon slices. 2. Put the fresh artichokes, remainder of the sliced lemon and bay leaf in enough boiling salted water to cover. 3. Simmer on a medium boil until the artichokes are soft (like a boiled potato) and the petals can be removed easily (anywhere from 30 minutes to an hour depending on size and toughness). 4. Remove the artichokes to cool slightly, and mix up the ridiculously easy balsamic mayonnaise (I suppose you could do this earlier and refrigerate the stuff so it sets up a bit, but you'd have to be a real foodie to do that). 5. Pull the petals off, one by one, dip them into the mayo, scrape the petals with your teeth, and enjoy one of the most delicious tastes Summer has to offer. Repeat often. (By the way, when you get to the bristles, just scrape them off with a fork until you get to the "heart" which is the pièce de résistance). Don't be afraid of the artichoke. Embrace it!